Is NASA’s Hansen Playing Enron Accounting Games With Climate Data? Since NASA's James Hansen finally released computer codes related to how climate data are collected and adjusted, anthropogenic global warming skeptics around the world have been waiting to see what a scientific examination of this information would produce. On Monday, Canada's Steve McIntyre, who himself debunked Michael Mann's ridiculous "Hockey Stick" theory as well as identified Hansen's Y2K bug, released information identifying that Hansen recently made additional changes to climate data akin to how companies like Enron used creative accounting to exaggerate earnings and defraud investors. Shortly after, NASA published their source code on Sept 7, we started noticing puzzling discrepancies in the new data set. On Sept 15, Jerry Brennan observed that the NASA U.S. temperature history had changed and that 1998 was now co-leader atop the U.S. leaderboard. By this time, we'd figured out exactly what Hansen had done: they'd switched from using the SHAP version - which had been what they'd used for the past decade or so - to the FILNET version. The impact at Detroit Lakes was relatively large - which was why we'd noticed it, but in the network as a whole the impact of the change was to increase the trend slightly - enough obviously to make a difference between 1934 and 1998 - even though this supposedly was of no interest to anyone. 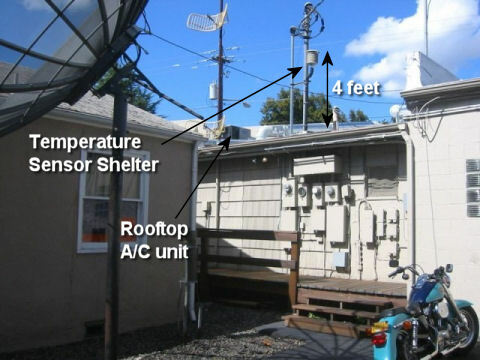 In very simplistic terms, SHAP and FILNET are computer programs used by climatologists to assist in the collation and interpretation of climate data. Each program does so differently, and, therefore, yields different final results. As such, by suddenly switching from SHAP - which NASA had been using for decades - to FILNET, NASA was able to once again claim that 1998 and 1934 are now tied for the warmest years on record in the U.S. This despite Hansen's claim in August that climate record changes precipitated by McIntyre's Y2K bug find were irrelevant. Now you may say that this is "science" and accounting principles don't apply. And my response would be that I'd expect GAAP principles to be a minimum standard for the type of climate statistics being carried out by NASA. Even if NASA climate statisticians are unaware of GAAP per se, they should be adhering to the principles. Sharp practice is sharp practice, however it is gussied up. Companies cannot change accounting procedures on a whim. Auditors will not permit companies to change methods merely to enhance reported earnings. And if a company changed accounting procedures without any disclosure, it would be viewed very seriously by regulatory agencies - whether or not the company said that it "mattered". If the change from SHAP to FILNET accounting didn't "matter", then Hansen shouldn't have done it. If it did matter, he still shouldn't have done it right now just when he was archiving source code for the first time - and to do so without either formal disclosure or a re-statement of prior results simply boggles the imagination. Of course, when Enron and other companies were found to be cooking their books at the expense of investors, this was front page, headline news for months. Do you think these revelations by McIntyre will be reported by media any time soon? My first indication that something changed came from surfacestations.org volunteer Chris Dunn who wrote to me complaining that one of the sites he'd recently surveyed, Walhalla, SC had been greatly adjusted at GISS for no good reason that he could ascertain, since the site is pristine by climate monitoring standards, and has not gone through any significant changes in the past, and has been operated at the same location (by the same family) since 1916. He wondered why NASA would have to adjust the data for a "good" station. The way I view it, shouldn't good data stand on it's own? That was September 7th. He was using data from NASA GISS published on 8/28. So he continued to look at the data, and the site. The [sic] on Sept 11th he noticed a change when he downloaded the data again. Something had changed, the data was different. Not only the adjusted data but the "raw" data too. Whether this was accidental or intentional I cannot say, but it certainly does not look good coming on the heels of NASA GISS's most recent issue of a mistake causing a revision of our temperature history on August 8th. We deserve better accounting than this when so much hinges on this data. I agree, Anthony. Unfortunately, it appears that only people who read conservative blogs are going to find out about this, because it is a metaphysical certitude major media outlets will ignore this issue.